Halloween night may be in the past, but Dia de Los Muertos is now dead ahead, and the best place to celebrate los muertos is in San Francisco’s beloved Mission District. Now is the time and the Mission is the place to enjoy a crawl through the streets with the dead. 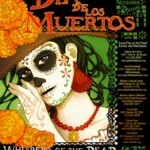 Our Dead Love author, Linda Watanabe McFerrin, writes wistfully about the experience in her essay “Noche de Los Muertos.” I’m posting a short excerpt. For the full story go the the S.F. Chronicle archive. And join us in the procession on November 2nd at 7 p.m.
… Every year in the Mission, on the heels of Halloween, the Dia de Los Muertos Procession, part of a celebration that fuses Aztec beliefs in death and afterlife with the Christian Day of All Saints, sets forth from the corner of 24th and Bryant. This is, in many ways, the spiritual heart of San Francisco. Mission Dolores, where Franciscan fathers founded what is today California’s oldest intact mission, is a short walk away, and much of this area still retains its alluring blend of Old and New World ritual. Over 10,000 people crowd the crossroads on the night of this supernatural juncture, and yet the scene is oddly subdued, laced with a potent mix of reverence and expectation. Around his neck, Jeff wears a photo of his brother. Many people carry photographs or remembrances of lost loved ones. In my heart I hold a picture of my mother who died a few months before. My votive candle, or velador, which I purchased at the little store adjacent to the Galeria del la Raza, is tall and sparkled with red. It has a picture of a heart painted upon it, and it says, “corazon,” the word for heart in Spanish. In preparation for this night, the shelves of the shop are populated with skeletons. There are white sugar skulls dressed in hot colors, devil and skull rattles made out of papier-mâché, and brightly-dyed mesh and oilcloth bags bearing images of Frida Kahlo, Anima Sola, La Catrina, the Virgen de Guadalupe and other popular icons. There are femur-trimmed picture frames, books about the Day of the Dead and row upon row of gorgeously embellished velas. People flow into the intersection, greetings exchanged in murmurs. Lowry and I spot Kara, John, and their beautiful baby girl, Ruby who, it turns out, live just down the street. My black bag is filled with tiny votive candles. I hand one to Ruby. Kara helps light it. Little Ruby’s eyes widen as the first skeleton she has ever met hands her a gift. Fingers of incense rise up from the crowd and twirl away into the twilight. Then there is music, Aztec flutes and drums, and the procession sets off at a dreamy shuffle. Up 25th we amble reflectively—mothers, fathers, children, pets—and then down 24th, the music, the smoke, the bruisy-blue warmth of an Indian summer eve massaging us into altered states. On the sidewalks around us—in the clubs, the taquerias, and all-night laundromats—the denizens of the Mission, many Hispanic, most just finishing or beginning dinner, watch the procession and smile. Our crowd stretches across the street. We feel powerful and anonymous, magically garbed as the dead. On the corners, the musicians stop to perform. But it is in Balmy Alley as the parade nears its final destination and the crowd thins, by necessity, to a sly trickle that this otherworldly assembly comes truly alive. Pirates, babies, ingénues, clowns, old men, dancing girls, drummers and dogs shake, rattle and roll their clavicular way down the bemuralled aperture. It is tight and close in the narrow passageway and warm and suffocatingly intimate, and I have never felt safer than, here, in this dimly lit funnel of a street surrounded, as I am, by the dead. We wait, let the circus push past, then follow it, burped back out into the open on 25th between Treat and Harrison Streets at the southern end of Garfield Park. The park is aglow with candles and altars. The bands set up on the sidewalks around it. Creepily clad celebrants cavort at its corners. A big group gathers at an altar in front of a swing set wrapped in crepe paper and garlanded in flowers where papier-mâché skeletons sitting on swings are caught in eternal frolic. Amid velas and pictures and offerings and incense, people crouch, kneel and sit in aspects of meditation and prayer. I wander through the park adrift in the half-light, watch the young, the old, the living, the dead, circle, pause, and salute one another. The smoke of our candles, the light of our flames, the energy of our dreams and hopes and love flare up and out, and the darkness bears down to embrace us. The community of both worlds swings back and forth, back and forth, on the arc of a fearless affection. The dead never leave us; we leave them, not knowing how to entertain spirits, how to keep them at home in our lives. Tonight we remember; we make room for the dead. Tonight, they are among us. nice image! And, yes, this is the day not to miss! Bet the zombies are eating up the deadened spirits of those left in the wake of the giants returning to SF. 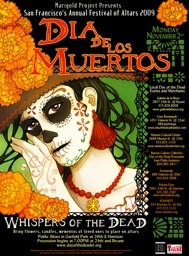 Nothing like an article by Linda Watanabe McFerrin to crown the magic and reverence of Dia de Los Muertos – thanks for the post, Erin. Today it is the turkeys that are being eaten. Waaaah.